Astronomers can never hope to travel to black holes and instead rely on the coded infomation contained within the light detected from around these distant objects. The visible light to which our human eyes are most sensitive represents only a small fraction of the total light available for collection; technological advances in the 20th and 21st centuries have ensured that we can collect light ranging from the highest energy gamma rays, through X-rays to long wavelenght radio waves – the whole range of the ‘electromagnetic specturm’. 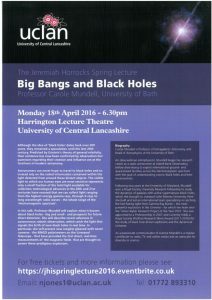 In this talk, Professor Mundell will explain what is known about black holes – big and small – and prospects for future direct detection. She will describe recent advances in autonomous robotic observation, which catch the light that signals the birth of new black holes in real time. In particular, she will present new insights gleaned with novel cameras – the RINGO polarimeters on the Liverpool Telescope – have provided the first direct, real-time measurements of the magnetic fields that are thought to power these prodigious explosions. Carole Mundell is a Professor of Extragalactic Astronomy and Head of Astrophysics at the University of Bath. An observational astrophysicist, Mundell began her research career as a radio astronomer at Jodrell Bank Observatory, before diversifying to exploit international ground- and space-based facilities across the electromagnetic spectrum with the goal of understanding cosmic black holes and their environments. As a passionate communicator of science Mundell is a regular contributer to radio, TV and online media and an advocate of diversity in science. 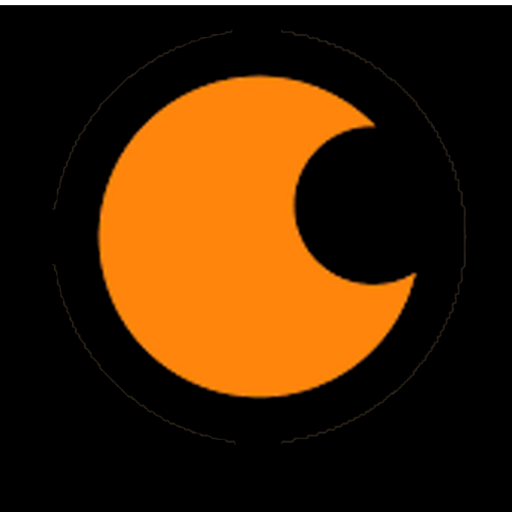 6pm to 9pm – Get your free ticket here. 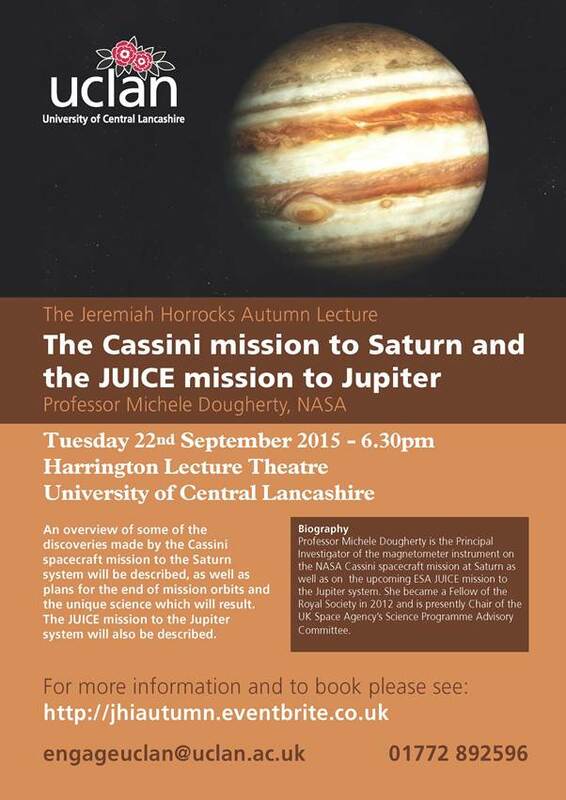 Whether you are a budding stargazer, a seasoned astronomer or would simply like an introduction to this fascinating subject please come along and find out more. 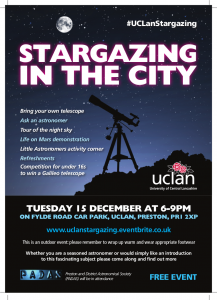 The evening will include: A Tour of the Night Sky by one of UCLan’s senior astronomers, a Life on Mars demonstration from our Young Scientist Centre and an Ask an Astronomer stand for questions, enquiries and general wonderings. Children will be welcome at the Little Astronomers Activity Corner and there will be a chance to win a Galileo telescope. Bring along your own telescope or have a look through one of ours. This is an outdoor event so please wrap up warm and wear appropriate shoes. It may be advisable to bring a small torch to aid you in navigating the site. Refreshements will be available for a small charge. Please note that in the case of extreme weather this event may be cancelled at short notice. You will be notified via email if this is the case. Clear skies! Free car parking will be available on UCLan campus car parks, the closest of which are Victoria and C&T (please note that Pay & Display Machines will not be operational during this time). To find the event venue or the closest available car park please use the following map. Limited on-site priority disabled parking will be available to those who need it, this will need to be prebooked by emailing us or telephoning 01772 896448. Abstract: he great discoveries of the “Astronomical Renaissance”, by Copernicus, Tycho Brahe, Kepler and Galileo, were made in Continental Europe. It may seem strange, therefore, that the next great steps forward-in planetary dynamics, telescopic observation, ellipticalorbit demonstration, and practical instrumentation – occured across 80 miles of Lancashire and Yorkshire countryside, between Liverpool, Preston, Salford, and Leeds. Yet this is exactly what happened. Three private individuals, fully informed of the European discoveries, were at the forefront of the next wave of astronomical innovation: Jeremiah Horrocks of Liverpool and Preston; William Crabtree of Salford; and William Gascoigne of Leeds. 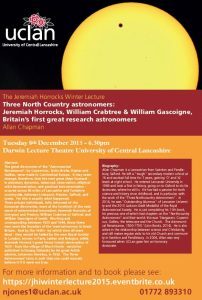 Working and corresponding between 1635 and 1644, these three men were the founders of the ‘new’ astronomy in Great Britain. And by the 1660s – by which time all were dead – they would be hailed by the new Royal Society in London, known in Paris, Leiden and Bologna, while Jeremiah Horrock’s great Venus transit observation of 1639 – from the village of Much Hoole – would be published in Danzig (Gdansk) by his great Polish admirer, Johannes Hevelius, in 1662. The Three Astronomers’ story is such that one could scarcely believe it if it were not true. Allan Chapman is a Lancastrian from Swinton and Pendlebury, Salford. He left a “tough” secondary modern school at 16 and worked full time for 7 years, gaining ‘O’ and ‘A’ levels at night school. He entered Lancaster University in 1969 and took a first in history, going on to Oxford to do his doctorate, where he still is. He has had a passion for both science and history since childhood, and in particular, with the work of the “Three North country Astronomers”. In 2014, he was “Outstanding Alumnus” of Lancaster University and the 2015 Jackson-Gwilt Medallist of the Royal Astronomical Society. He is just completing his 11th book, his previous one of which had chapters on the “Northcountry Astronomers” and their world: this was ‘Stargazers: Copernicus, Galileo, the telescope and the Church. The Astronomical Renaissance, 1500-1700.’ (Lion Books, 2014). He is also active in the relationship between science and Christianity, and still makes regular visits to his old Church and community in Swinton and Pendlebury. in 2004, Allan was very honoured when UCLan gave him an honorary doctorate.